If you are looking for ways to update your kitchen, bathroom, and/or storage spaces, you may consider giving your cabinetry a face lift. Refacing or refinishing your cabinets is a great way to overhaul the look of your home without the drawn-out process of demolition and full renovation. 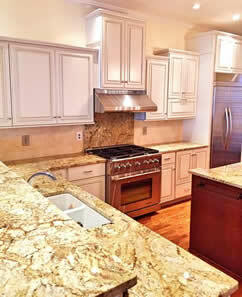 Additionally, if you love your countertops, you can keep them right where they are while we give your home a new look. The name says it all: cabinet refacing is where you keep your kitchen cabinet boxes and put a new face on them. Our custom cabinet refacing uses real wood doors such as maple or cherry. We use real wood veneers on the face and sides, and if you want a painted look, we actually paint the boxes on-site and don't use a veneer. 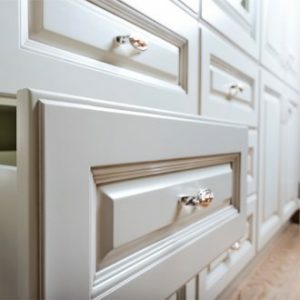 Cabinet refinishing is where you keep your kitchen cabinet boxes, doors, drawers, and other components and proceed to change the color cosmetically. As another economical option to replacing your cabinets, refinishing often involves sanding and restaining/repainting your cabinetry. Refinishing is not always an option depending on the condition of your cabinets and the original materials used. Our cabinetry and woodworking experts will come directly to you to take a look at your home projects and discuss your needs. We will bring our showroom to you, including samples of different wood types, finish options, and hardware. Pick what you like best! We can measure out what is needed for your kitchen or bathroom on the spot. Gathering the correct measurements the same day saves you time (and math calculations). Once we have your choices and measurements, we can print out a quote for you to have directly. Easy and hassle free! Enter Your Information Below To See How Much We Can Save You! Cabinet refacing is a simple concept that started sometime back in the 1970s. The name says it all: cabinet refacing is where you keep your kitchen cabinet boxes and put a new face on them. It’s an economical way to upgrade your kitchen without a complete tear out. In those days, cabinet refacing involved applying a plastic laminate to the face frame and sides of the cabinet. The doors were made of plastic laminate and would match the face frames, with the laminate being applied over a plywood panel. This is not how we do things at Detail Design. Watch our video to learn more about our our process for cabinet refacing. Today, cabinet refacing has become much more complex. Some companies choose very inferior and inexpensive products like a painted medium density fiberboard (MDF) door and drawer front, while companies use something called an RTF door (Rigid Thermofoil), which is a plastic foil or sheet that is wrapped over an MDF panel. These can look like real wood or a painted surface. There are drawbacks to using these materials, especially in warm areas, like any cabinets next to the oven, are that they are likely to shrivel up when too much heat is released from the oven. In other cases, the areas around the dishwasher or sink can absorb moisture, and the MDF will expand and cause the plastic to come loose. Sometimes, the plastic panel will just pop off the door. We have also seen white kitchens that have turned yellow while some doors turned yellow and some stayed white! The companies that use these products for cabinet restoration like them because they are easy to install and easy to sell. They can usually finish a kitchen in a day or two. There are very few occasions where we would recommend this product. Our custom cabinet refacing uses real wood doors such as maple or cherry. We use real wood veneers on the face and sides, and if you want a painted look, we actually paint the boxes on-site and don’t use a veneer. We can also modify or add cabinets. If we change drawer boxes, we usually use dovetailed, clear coated, full extension glides. We will add pull-out shelves in some cabinets to make them more functional. Do you like the layout of your kitchen? Even though we can make a few modifications, there is a point where it makes more sense to do new cabinets. Basically, the more changes you make to the layout by modifying existing cabinets, the closer you get to justifying a full tear out. With most cabinet refacing projects we do, we might make a few cabinet changes, but overall, the customer wants us to keep the basic layout. Are the cabinet boxes in good shape? We rarely see boxes that are too bad for cabinet refacing, but it does happen! 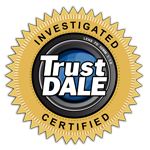 Do you have existing granite countertops or something similar and don’t want to replace them? We see this quite often. There is no practical way to remove tops and install new cabinets and then re-set the existing top. The fact is that when you look at a kitchen cabinet, the part you see is the most important part! The doors, drawer fronts, face frames, and any trim set the style and look of the kitchen. One benefit of a custom cabinet refacing project is the ability to create the exact look you want. You may have an old 1990’s white Thermofoil kitchen and you want to go to a nice, traditional stained look. That is easy to do! Maybe you have nine-foot ceilings and your cabinets only go eight feet, which is very common, but you want yours to go to the ceiling. This is easy for our team of home remodeling contractors to accomplish. We have an enormous amount of door style options, color options, and trim options that we can use to come up with almost anything you have in mind!